Scholastic (December)! Congratulations! ... Marcell Szabo (Hamilton Middle, Seattle) and Marc Huang (Bellevue Children's Academy) are the new 6th and 4th grade national champions, respectively, from Washington state in the National K-12 Championships held Nov. 30-Dec. 2 in Orlando, Florida. (Huang tied with five others.) See the results on the USCF website. See a report on the NWC blog. 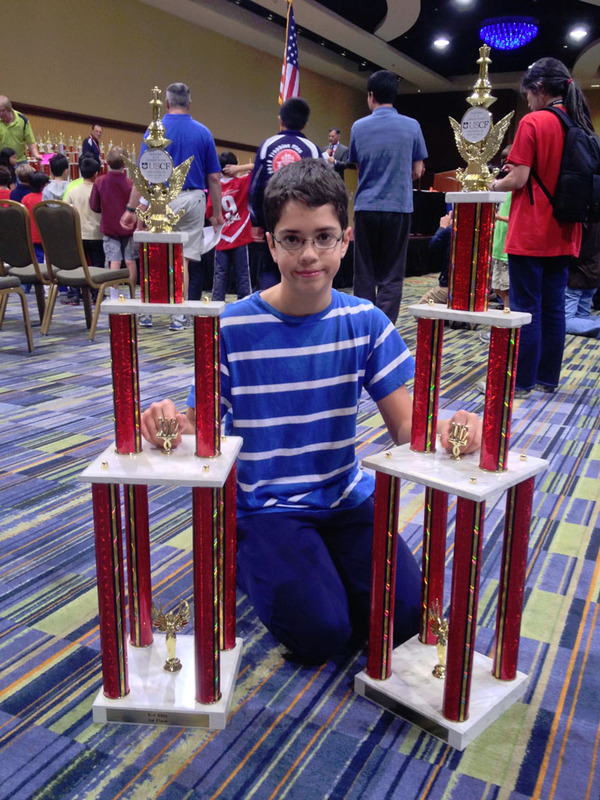 Photo: Marcell with both trophies (left: blitz K-6 in which he also finished first, right: regular 6th grade first place). Photo courtesy of the Szabo family. December! Seattle Chess Club Year End Event (Dec 28-29); Portland CC G/60 (Dec 29) - This event had 22 players. The winner was Yogi Saputra of Albany, Oregon with a 3.5-.5 score. Gregori Alpernas of Lake Oswego, Oregon handled the TD tasks; Portland Winter Open (Dec 15-16) - Steven Breckenridge of Gresham and Andrew Larson of Florida tied for first place with 4-1 scores. They both took a 1/2 point bye and drew with Bill Heywood of Portland. At 3.5-1.5 were Alfred Pechisker and James Chan, both of BC. 19 players in this section. The lower section was won with a 5-0 score by Dillon Murray of Gresham. Tied for 2nd at 4-1 were Bradley Bogle of Oregon and Valentine Molchanov of Beaverton. 23 players in this section. USCF crosstable link - See Rusty Miller's photos on Flickr; Seattle CC Sunday Tornado (Dec 16) - 24 players took part in this event. Fred Kleist of Seattle was the tournament director. There was a tie for first place between Patrick Van Dyke of Maple Valley, WA and Bryce Tiglow of WA at 3.5-.5. They drew with each other in round four. Three players had 3-1: Daniel and Samuel He of Redmond plus Noah Fields of Tacoma. USCF crosstable link; Christmas Congress (Dec 8-9) in Tacoma, WA - The usual TD, Gary Dorfner of Tacoma, in the usual place - the Tacoma Chess Club - held the Christmas Congress with just 9 players. Alan Bishop of Tacoma took a 1/2 point first round bye and then won the rest of his games for a 3.5-.5 score including a win over NM Viktors Pupols (3-1) of Kingston, WA. USCF crosstable link; Western Idaho Open (Dec 8-9) in Boise, ID. 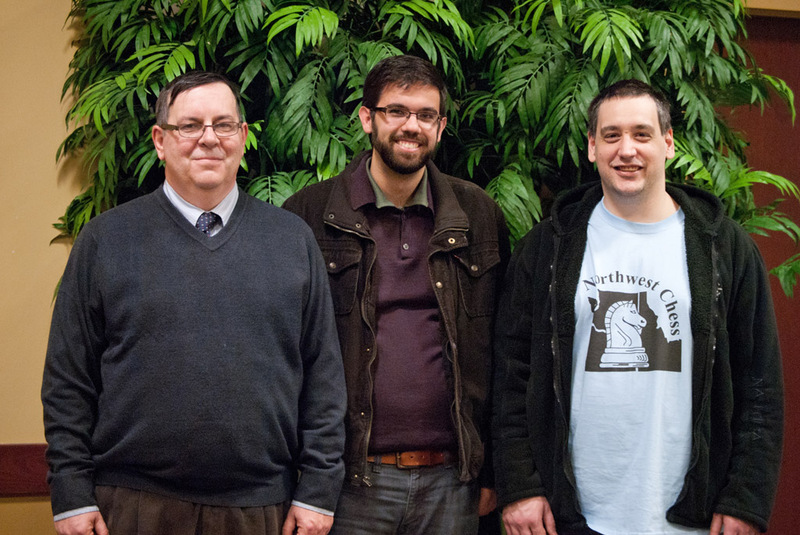 Photo (left to right): GM Alex Yermolinsky, Joshua Sinanan, and Nick Raptis at the WIO. Photo credit: Jeff Roland. Yermolinsky won with 4.5/5, Raptis finished second with 4/5 - USCF crosstable link; Portland Saturday Quads (Dec 8); Simultaneous Exhibition by Washington Master Josh Sinanan (Dec 7) in Boise, ID; Rain City Plus-Score Swiss (Dec 1-2) in Seattle - This tournament was held at the Seattle Chess Club under the direction of Fred Kleist of Seattle. Viktors Pupols of Kingston won the event with a perfect 4-0 score. The event had 13 players and a time control of G/125 with 5-second delay. USCF crosstable link. Scholastics (November)! 92 kids in 5 sections took part in the Thanksgiving Scholastic held Nov 23 in Redmond, WA - a one-day event held as part of the Washington Class. David Hendricks was the TD. Winners: K-3 Open - Yu, Jason with a 5-0 score. K-3 U800 - Zhang, Jack with a 4-0 score. 4-6 Open - Zhang, Zachary with a 5-0 score. 4-6 U900 - Fong, Byron with a 4.5-.5 score. 7-12 Open - ended in first place tie between Cherepakhin, Olga and Ranganathan, Amartya, both scoring 4-1. NW ratings crosstables link. USCF crosstables link (for USCF-rated sections). | The Fall Classic (Nov 17) in Eugene, OR had 68 total players, directed by TD Jerry Ramey. See a report on the NWC blog. See crosstables / NWSRS ratings. | Several Northwest players competed in the World Youth Championships in Maribor, Slovenia, including Anthony He, Naomi Bashkansky (see the family's chess travel blog), Becca Lampman, Roland Feng and Bryce Tiglon. See full results of our 80+ delegation on chess results.com, and see the story on the USCF website. Overall, Team USA won third place behind Russia and India. November! Washington Class Championships (Nov 23-25) in Redmond, WA - See PDF flyer, USCF crosstable link; Seattle CC Sunday Tornado (Nov 18) - 18 players took part in the G/60 delay 5 quick and regular rated Seattle Chess Club Tornado. Marcell Szabo of Seattle won the Fred Kleist directed event 4-0. USCF crosstable link; Portland CC G/60 (Nov 17) - The field of 10 at this event was sweep by Matthew Sellers by his 4-0 score. Neil Dale was the TD. USCF crosstable link; Spokane G/10 (Nov 17); Wenatchee Valley Open (Nov 10-11) - cancelled due to lack of advance sign-ups; Seattle Chess Club Extravaganza (Nov 2-4) - This event was held in two sections under the directorship of Fred Kleist. There were 18 players in the Open section, which was won with 6.5-.5 score by Roland Feng of Seattle. He drew with Bryce Tiglon of Redmond. Gabriel Zlovog won the reserve section with 5.5-1.5 over 13 others. USCF crosstable link; Southern Idaho Open (Nov 3) in Twin Falls, ID; Turkey Open (Nov 3-4) in Missoula, MT. October! Several Pacific NW players tied or won 1st place in their section of the U.S. National G/30 Championships held in Pleasanton, CA on Oct 27. There were 204 players in 8 sections. 1300-1599 section had Arjun Thomas of Shoreline, WA tie for 1st with 4.5-.5. 1000-1299 section was won by Josiah Perkins of Oregon with 5-0. 600-799 section was won by Joshua Grabinsky of Coquille, OR with 4.5-.5. USCF crosstable link; One Pacific NW player won 1st place in a section of the U.S. National G/60 Championships also held in Pleasanton, CA on Oct 28. There were 251 players in 10 sections. The 600-799 section was won by Joshua Grabinsky of Coquille, OR with 3.5-.5. USCF crosstable link. Washington Challengers Cup (Oct 27-28) in Seattle - The annual Challengers' Cup Chess Tournament was held at the Seattle Chess Club under the sponsorship of the Washington Chess Federation and direction of Fred Kleist of Seattle. 27 players took part in the Challengers' Section and ended in a tie at 3.5-.5 between Tian Sang of WA and Roland Feng of Seattle. The Reserve Section had 32 players and also ended in a two-way tie but at 4.5-.5 between Dave Jones and Stuart Rowe, both of Seattle. USCF crosstable link. Photo: Bd. 1, Viktors Pupols (not shown) getting ready to start his game vs. Curt Collyer; Bd. 2, Joshua Sinanan with the White pieces against eventual co-winner Tian Sang; Bd. 3, Marcell Szabo (sitting next to Sang) against 11-year-old Roland Feng; Bd. 4 Kyle Haining vs. Harley Greninger. Frank Niro photo. Portland Club Championship (concluded Oct 30); Tacoma Chess Championship (concluded Oct 26); Portland CC G/60 (Oct 27) - Neil Dale of Portland handled the TD tasks for this event. 13 players took part resulting in a 4-0 win for Yaman Tezcan of Portland. USCF crosstable link; 28th Annual Sands Regency Western States Open (Oct 19-21) in Reno, NV - see Rusty's blog post and USCF crosstable; Seattle CC Novice (Oct 14); National Chess Day (Oct 13); Seattle CC Saturday Quads (Oct 13); National Chess Day at Valley Mall (Oct 13 in Spokane) - [reported by David Griffin] The Spokane Chess Club hosted an all-day event at Uncle's Games in the Spokane Valley Mall. There were four different events. The events were an action event of G/30, a G/15, blitz and a three-hour simul. Cameron Leslie won both the G/30 and G/15. Mark Havrilla won the blitz. Both Cameron Leslie and James Stripes played in the simul. There was also a fundraiser with several drawings with prizes donated by local businesses; Portland Fall Open (Oct 13-14) - Of the 14 players in the Open Section, the winners at 4-1 score were Portland residents Nick Raptis and Brian Esler. Nick won three and drew two games including handing Brian his only loss. 15 players took part in the Reserve Section which was won by Jon Strohbehn of Vancouver with 4.5-.5. Gregori Alpernas of Lake Oswego handled the TD tasks. USCF crosstable link; In events held at the Seattle Chess Club (Oct 5-13) the victors were Roland Feng of Seattle in a match, 2-0 over Viktors Pupols of Kingston; Quad A Samuel He of Redmond 2.5-.5, Quad B Gabriel Zlavog of WA and Ralph Anthony of TN 2-1, Quad C August Piper of Seattle 3-0, and the six-player Mini-Swiss Sujalha Chalasani of Bothell with 2.5-.5. Fred Kleist handled the TD tasks. USCF crosstable link; Wood River Weekend Progressive (Oct 6 in Hailey, ID); Oyster Bay Inn Classic (Oct 6-7 in Bremerton, WA) - Kristen Dietsch of Bremerton, WA directed this event. The 11-player Open Section was won with a 4-0 score by Michael MacGregor of Tacoma. Jothi Ramesh of Shoreline, WA topped the other 9 players in the Premier Section with a 3.5-5 score. 6 players took part in the Reserve Section won with a 3.5-.5 score by Jeremain Dennehy Jr. of Portland. USCF crosstable link; Eastern Washington Open (Oct 6-7 in Spokane) - Cameron Leslie of Idaho's score of 4.5-.5 topped the 26 player field. Seven other Idaho players took part plus two from Montana. Loyd Willaford of Colville, WA was the TD. USCF crosstable link. See Spokane Chess Club Facebook page for a more complete story; Seattle CC Sunday Tornado (Oct 7) - Two way tie for first in this monthly event. Marcell Szabo of Seattle and Masayuki Nagase of Redmond both scored 3.5-.5. 19 players took part under the direction of Fred Kleist. USCF crosstable link; Cedar Hills Serious Sunday Slam (concluded Oct 7 in Beaverton, OR). September! Seattle CC Sunday Tornado (Sep 30) - Roland Feng of Seattle scored 4-0 to top this 35-player Fred Kleist directed event, once again pushing Feng's rating over 2200. USCF crosstable link; Portland CC G/60 (Sep 29) - 19 players took part including three unrated players. Nick Raptis won with 4-0. The TD was Gregori Alpernas. USCF crosstable link; Tacoma CC Autumn Equinox Open (Sep 29) - Eric Woodlief won 3-0 in the 6-player event held at the Tacoma Chess Club. Eric had not played any USCF-rated chess since 2007. Gary Dorfner was the TD. USCF crosstable link; Seattle Fall Open (Sep 21-23) - The Seattle Chess Club held this annual event at the club meeting rooms. 30 players took part in the Open Section, and Dereque Kelley of Seattle topped the 30 players with 4.5-.5. The drawn game was with young Roland Feng of Seattle. Joth Ramesh of Shoreline won the Reserve Section in which 29 players took part. He also scored 4.5-.5. His draw was with Jan Buzek of Seattle. Fred and Carol Kleist were the tournament directors. USCF crosstable link; Eastern Idaho Open (Sep 22-23) in Pocatello; Bridgetown and Rose City Open Blitz Chess Championship (Sep 23) in Portland; Taste of the Harvest Open (Sep 15-16) in Wenatchee, WA - cancelled due to wildfires and smoke; The Cedar Hills Crossing Quick 002 (Sep 10) was held in Beaverton, Oregon under the direction of Sean Tobin of Portland. 12 players took part in the G/25; d3 event. Robert Herrera of Hillsboro topped the field with 3.5-.5. USCF crosstable link; Seattle CC Octagonals (Sep 9) - Ethan Bashkansky won the highest-rated section 3-0 and improved to an 1860 rating. USCF crosstables link; Portland Saturday Quads (Sep 8) - USCF crosstables link; Wash. Senior Adult Championship (Sep 8) and Wash. Women's Championship (Sep 8) in Seattle - The Washington Senior Adult Championship was held at the Seattle Chess Club under the direction of Gary Dorfner of Tacoma. Seven players took part, ending in a tie at 3-1 between Paul Bartron of Tacoma and Mark Smith of Seattle. USCF crosstable link. At the same time and place a four-player Washington Women's Championship was held. Chouchanik Airapetian of Edmonds topped that event with a 3-0 score. USCF crosstable link; Oregon Open (Sep 1-3) in Gresham - See PDF flyer/entry form / See some photos. This annual event was held Labor Day weekend at Mt. Hood Community College in Gresham, and ended in a 6-way tie in the Open Section at a 4.5-1.5 score. Winning $175 each were Nick Raptis of Portland, Roland Feng of Seattle, Michael MacGregor of Tacoma, Matt Sellers of Michigan, Nathan Lee of Issaquah, WA and Paul Bartron of Tacoma. 42 players were in the Open Section. 47 players played in the Reserve Section (U1800), and that ended in a two-way tie at 5-1 between David Yoshinaga, Oregon Chess Federation President of Tigard and Takuma Sato-Duncan of Oregon, good for $295 each. Gregori Alpernas of Lake Oswego was the chief tournament director. USCF crosstable link. Portland CC crosstable link (includes prize money winners and amounts); 7th Annual Langley Open (Sep 1-3) in Langley, BC - See Langley Chess website. August! Seattle CC Sunday Tornado (Aug 26) - 18 players took part. Peter O'Gorman's score of 3.5-.5 topped the field. Fred Kleist handled the TD tasks. USCF crosstable link; Puget Sound Open (Aug 25) in Tacoma, WA - This event was held at the Tacoma Chess Club under the direction of Gary Dorfner. 15 players took part, up from the six players in the 2011 event. Three had the top score of 3.5-.5. They were Paul Bartron of Tacoma, H. G. Pitre of Seattle and John Schwarz of Lacy. USCF crosstable link; Portland CC G/60 (Aug 25) - Blake Salisbury was the winner with 3.5/4. USCF crosstable link; Seattle Chess Club Dog Days Swiss (Aug 3-24) - 19 players took part under the direction of Chris Babcock. Michael Darby ran up the top score of 3.5-.5. USCF crosstable link; Seattle CC Saturday Quads (Aug 18). U.S. Open in Vancouver! 113th annual U.S. Open (Aug 4-12) in Vancouver, WA. First-weekend events included a free Simultaneous Chess Exhibition by Oregon Chess Champion Steven Breckenridge (Aug 4) in Portland, OR, and the 2012 U.S. Open Weekend Swiss (Aug 4-5) in Vancouver, WA. Archive page of U.S. Open tournament announcements. See daily reports on the Northwest Chess blog. See official USCF crosstable. | See "Reflections on a Model U.S. Open" by Al Lawrence (USCF). See Rusty Miller's photos on Flickr. See story in the SnoValley Star, "A pair of Valley chess players will compete in U.S. Open." See story "Former Chelan Residents Receive Chess Awards" from Go Lake Chelan. See story "Bits 'n' Pieces: U.S. Chess Federation honors Vancouver couple" from The Columbian. Scholastics (July)! The Idaho Chess Association reported on the Susan Polgar Girls Invitational, played in St. Louis, Missouri, July 22-27, 2012. July! Seattle Seafair Open (Jul 27-29) - The top score in this annual event hosted by the Seattle Chess Club was 4.5-.5, by Peter Lessler of Seattle and Igor Ummel of Arlington, WA. 57 players took part in the event directed by Fred and Carol Kleist. Also that same weekend a two-game match was held between 2400+ rated players Howard Chen of Monroe and Michael Lee of Bellevue. Chen won 1.5-.5. USCF crosstable link. The Seattle CC also held a 27-player event called Seattle Chess Club Hot-As-Hades (Jul 6-27). The top score was 3.5-.5 by Raul Torres of Seattle. Fred and Carol Kleist preformed the TD duties. USCF crosstable link; Portland CC G/60 (Jul 28) - There was a first place tie between Nick Raptis and John Chernoff at 3.5-.5. They drew with each other in round 4. Neil Dale directed the 22-player event. USCF crosstable link; Run/Chess Championship (Jul 28) in Newport, OR; Seattle Chess Club Novice (Jul 21); Washington Speed Chess Championships (Chess4Life hosted on Jul 21) in Bellevue, WA - Congratulations to Roland Feng, the clear winner with 12.5 of 14 points in the 7-round event (with each round consisting of two games). Karthik Ramachandran finished second out of the 35-player open-section field with 11.5 points; Seattle CC Sunday Tornado (Jul 15) - Dereque Kelley of Seattle won this event with a score of 4-0. Fred Kleist of Seattle directed the 34-player event. Time control was G/60 with 5 second delay. USCF crosstable link; Northwest Open (Jul 14) - Paul Barton of Tacoma won this event held at the Tacoma CC under the direction of Gary Dorfner. 9 players took part. Paul's score was 4-0. USCF crosstable link; Three players from the Pacific Northwest took part in the 2012 U.S. Senior Open (Jul 9-14) in Houston, Texas. All three scored 4-2. Carl Haessler of Lake Oswego, OR losses were to the number 1 and 2 place finishers, GMs Alexander Ivanov (5.5-.5) and Sergey Kurin (5-1). H.G. Pitre of Seattle and Dan Mayers of Idaho were the other two PNW players, out of 61 total players. USCF crosstable link; Portland Summer Open (Jul 14-15) - This event was sponsored by the Portland CC and held at the club rooms. 20 players took part in the Open section and the clear winner at 4.5-.5 was Brian Esler of Portland. 20 players also in the Reserve Section, with a 3-way tie at 4-1 between Patrick Gay of Tigard and Clemen Deng and Matthew Stevens, both of Portland. Gregori Alpernas of Lake Oswego was the chief TD. USCF crosstable link; Spokane Falls Open (Jul 14-15) - This event was held guess where ... Spokane ... and had 27 players taking part. Jeremy Krasin of Spokane won the event with 4.5-.5. David Griffin handled the TD duties. At the same time a match for the Spokane City Championship was held. John Julian of Spokane Valley retained his title with a 2.5.-.5 score over James Stripes. USCF crosstable link; ICA Summer Classic	(Jul 14-15) in Boise, ID; 49th Canadian Open Chess Championship (Jul 8-13) in Victoria; Seattle CC Saturday Quads (Jul 7). Oregon Senior Chess Championship (Jul 7-8) in Oregon City - co-champions Michael Morris of Oregon and David Rupel of Washington tied with a 4-1 record against a formidable 28-player field. The event was held at the Oregon City-West Linn Chess Club. USCF crosstable link. Photo: Morris (left) and Rupel (right) share the Dr. Ralph Hall Memorial Award trophy. Credit: Brian Berger. 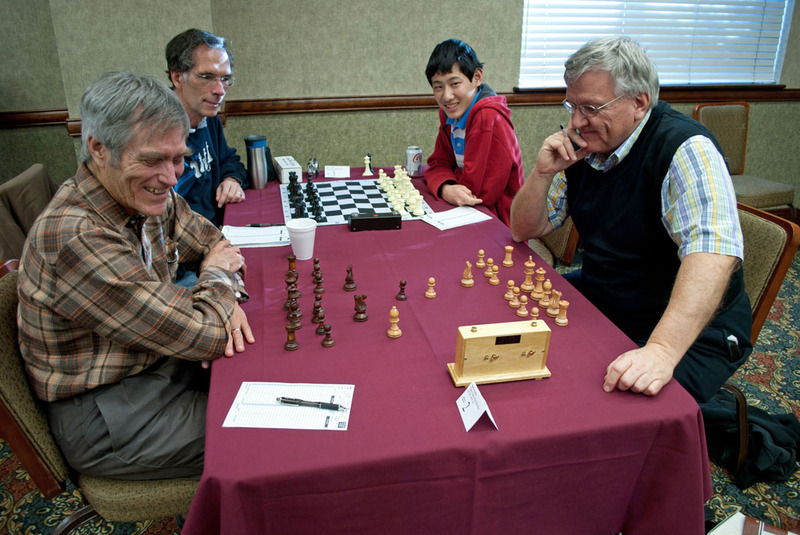 More information: Dr. Ralph Hall, longtime Oregon chess player and organizer, passed away in January 2011. (See his memorial page on this website.) As reported by Brian Berger, many of Dr. Hall's chess items are now located on the second floor of the museum in Oregon City. The photo at right, supplied by Brian, shows one of four cases of his items. The above-mentioned trophy will also be on display after engraving the names of the 2012 Oregon senior champions. Special Matches (June)! Internet match - Portland Chess Club vs. Mechanics’ Institute Chess Club (San Francisco) (Jun 23). The outcome was 3.5 -2.5 for the M.I. in a very closely contested match. See Rusty Miller's photos of the event at the Portland Chess Club. Photo at left: PCC team (from left) - Harry Buerer (1286), Jason Cigan (1906), Mark Hanna (1552), Nick Raptis (2323), Mike Janniro (2000) and Bob Malone (1785). Photo credit: Mike Morris. The Mechanics Institute team was: Andy Lee (2292), Todd Rumph (2179), Payam Afkham-Ebrahimi (1873), Scott Poling (1788), Michael Hilliard (1494) and David R. Olson (1400). June! Portland CC G/60 (Jun 30) - This monthly event had 14 players and was won by the top rated player in the event, Nick Raptis, with 4-0. USCF crosstable link; Evergreen Empire Open (Jun 30) in Tacoma; Tacoma City Championship (concluded Jun 29); Emerald City Open (Jun 22-24) at the Seattle Chess Club - The event was directed by Fred Kleist of Seattle. The Open Section had 15 players and a first place tie at 4-1 between Roland Feng of Seattle and Karnik Ramachandran of Texas. Catherine Smith of Mill Creek, WA topped the 23-player reserve section with 4.5-.5. USCF crosstable link; Qualchan Quads (Jun 23) in Spokane; Meridian Invitational Chess Tournament (Jun 23), Meridian, ID; Las Vegas International Chess Festival and National Open (Jun 14-17) - Crosstables from tournament website; Newport June Open (Jun 16-17) in Newport, OR - This event had 19 players, under the sponsorship of the Central Coast CC and direction of Bill Barrese. Mikeal Davis of Dalles, OR won with 4.5-.5 while Becca Lampman, a young lady from Vancouver, WA, was second with 4-1. USCF crosstable link; Seattle Sunday Tornado (Jun 17) - 20 players took part in the Seattle CC June Tornado. The top place finisher with 4-0 was Patrick Van Dyke of Maple Valley, WA. Fred Kleist was the TD. USCF crosstable link; Summer Speed Chess Championships (Jun 10) at Portal Games in Portland; 5th Annual Treasure Valley Championship (Jun 9) in Boise, ID; Seattle Saturday Quads (Jun 9); Portland Saturday Quads (Jun 9); Hellgate Open (Jun 9-10) in Missoula, MT - USCF crosstable link; Tacoma Chess Club Economy G/60 Mini-Swiss (Jun 2). Scholastics (May)! National Elementary Championship (May 11-13 in Nashville, TN) - WA has a K-6 national co-champ (Feng), two K-5 national co-champs (Tiglon and Szabo) and a K1 national co-champ (He). WA teams also ended in top 5 in K6 (ODLE, 5th), K6U1000 (Medina, 3rd), K5 (Spiritridge, 4th), K3 (Spiritridge, 5th), and K3-unrated (Spiritridge, 1st) sections. There were also a number of individual co-winners in the K5U900 (Silverberg), K3U800 (Tiglon), and K3-unrated (Lawler, Ayyagari, Wei, Bulusu) sections. This is a very good showing at nationals! Articles: USCF website, final standings. (Reported by Hock San Lee.) Also see story, "Spiritridge chess teams finish in the top five at national tourney" from the Bellevue Reporter. | In addition to the first place finishers at Nationals, WA students captured first place in the National K-6 Blitz Championship tournament (Haining) and the National Bughouse Championship tournament (Fields & Haining). (Reported by Breck Haining.) | The annual WA vs BC International Scholastic Invitational (K-12) match was held on May 5 in Richmond, BC. For the first time in the history of this event, the result was a tie ... both sides were equal with 26 points! See report on the BC Junior Chess website. May! Washington Open (May 26-28) in SeaTac, WA - IM Georgi Orlov of Seattle won the 38 player Open Section with a 5-1 score. Premier Section of also 38 players was won by Yogi Saputru of Oregon 5.5-.5. He also won the U2000 prize in the Blitz event. Reserve Section of 33 players was topped by two players at 5-1, Andrew Porisch of Bellevue and Logan Macgregor of Redmond. Booster section had 38 players and again two players scored 5-1, Sean Miller of Washington and Howard Hwa of Bellevue. Fred Kliest handled the tournament direction. USCF crosstable link; Seattle CC Sunday Tornado (May 20). ICA Players Memorial (May 19-20, Open and Reserve) in Boise, ID - group photo supplied by Jeff Roland at left; 37th Annual Paul Keres Memorial (May 19-21) in Richmond, BC - See final standings / crosstable; Pierce County Open (May 19) in Tacoma; Portland CC G/60 (May 19) - Nick Raptis of Portland won yet another Portland CC G/60 event and again with 4-0 score. The weather must have been too nice as only 10 players took part in the Neil Dale of Portland directed event. USCF crosstable link; Seattle CC Saturday Quads (May 12); Portland CC Saturday Quads (May 12); Seattle CC Adult Swiss (May 5-6); Oregon Class Championships (May 5-6) in Portland - Fine turnout of 49 players total to about fill the space at the Portland Chess Club. The master/expert section was won with 5-0 by Daniel Gay and he now has a USCF master rating. 8 players in that section. Class A had two with top score of 3.5-1.5, Jacob Reid and Micah Smith in a 9-player section. In Class B, another perfect 5-0 score was reached by Yogi Saputa in a 10-player section. The Class C top scorer at 4.5-.5 was Takuma Sato-Duncan in an 11-player section. The Class D and Under was another tie at 4-1, Pranav Shmrand and Scott Svetal, in an 11-player section. The event was sponsored by the Oregon Chess Federation and directed by Dale Wentz of Salem. USCF Crosstable link. April! Portland CC G/60 (Apr 28) - The April G/60 at the Portland Chess Club was won by Nick Raptis with 3.5-.5. There were 12 players, directed by Neil Dale. USCF crosstable link; The Portland Chess Club April Quads had 16 players under the direction of Gregori Alpernas. USCF Crosstable link; Tacoma CC Mini-Swiss (Apr 28); 77th Montana Open (Apr 28-29) in Missoula - The 77th Montana Open title was won by two out-of-state players. Cameron Leslie of Idaho and Jeremy Krasin of Spokane scored 4.5-.5. There were two players from Idaho and five from Washington on the USCF crosstable. The TD was Daniel McCourt; Seattle CC Sunday Tornado (Apr 29) - Roland Feng of Seattle won the April Tornado under the direction of Fred Kleist. His score was 4-0 and there were 14 players. The time control was G/60 with 5 second delay, and the event was dual rated. Roland's USCF quick rating went up 177 points to 1660, compared to his regular rating of 2179. USCF crosstable link; April Showers, Downpour Section tournament was held at the Seattle Chess Club (Apr 6-27). The 25-player event was won by Michael Darby 3.5-.5. Fred Kleist was the TD. USCF crosstable link; Inland Empire Open (Apr 21-22) in Spokane, WA - 30 players took part in this event sponsored by the Spokane Chess Club. John Julian of Spokane Valley and Cameron Leslie of Idaho topped the chart with their 4.5-.5 scores. They did not play each other. Winners in the lower classes included Mark Havrilla and Michael Cambarreri (Class A), Kevin Korsmo and Jim McAleer (Class B), Tim Kennedy (Class C) and Jim Burney (Class D). Kevin Korsmo handled the TD tasks. USCF crosstable link; Idaho Open (Apr 21-22) in Pocatello, ID - includes a link to a nice 27-minute video posted on YouTube; 6th Annual Clark Harmon Memorial (Apr 13-15 or 14-15) in Seattle - Two fellows from Seattle won both sections and they had the same score, 4.5-0.5. Peter Lessler won the 13-player Open Section and Alan Walk won the 17-player Reserve. Fred Kleist handled the TD tasks of the event held at the Seattle Chess Club and organized by the Washington Chess Federation. The 2011 event had 53 players and was held at the Portland CC while the 2010 edition of the event held in Olympia had 18 players. USCF crosstable link; Portland Saturday Quads (Apr 14); Larry Evans Memorial Open (formerly Reno Farwest Open) (Apr 6-8) in Reno, NV - USCF crosstable link; 6th Annual Grand Pacific Open (Apr 6-9) in Victoria, BC; Tacoma CC Novice #1 (Apr 7); Seattle CC Sunday Tornado (Apr 1) - There were 15 players for the "April Fools" Tornado. Viktors Pupols of Kingston and Macello Szabo of Seattle drew with each other and won their other three games and so topped the results table. Fred Kleist of Seattle was the tournament director. USCF crosstable link; Spring G/30 (Rapid Chess Tournament, Apr 1), Portal Games in Portland. March! Portland CC G/60 (Mar 31) - Two way tie at 4-0 between Micah Smith of Vancouver WA and Nick Raptis of Portland for the top place at the monthly G/60 event. 26 players including one unrated took part under the direction of Neil Dale of Portland. USCF crosstable link; Daffodil Open (Mar 31) - The Tacoma Chess Club held their annual Daffodil Open, and only eight players took part in the event won with a 3.5-5 score by Joseph Kiiru of Tacoma. Appears he once played a lot in Iowa. Gary J. Dorfner handled the TD tasks. USCF crosstable link; Portland Chess Shop G/15 (Mar 25) - Russell Miller tried his chess skills at a G/15 quick chess event at The Portland Chess Shop in downtown Portland, OR. His skills at the time control are not so hot as he scored 1-3. About 26 players took part. No score keeping needed, touch move were the rules. This is a game store with website www.portalgamespdx.com. Becca Lampman of Vancouver, WA won the 10-player USCF-rated section 4-1. Galen Pyle handled the TD duties. See Rusty Miller's photos. USCF crosstable link; Seattle Spring Open (Mar 23-25) - This event, held at the Seattle Chess Club, was a two section event with 16 players in the Open Section and 35 in the Reserve. Megan Lee of Bellevue scored 3.5-.5 for 1st place in the Open. Igor Ummel of Arlington was 2nd, the only player with 3-1. Alan Walk of Seattle scored 5-0 for 1st in the Reserve Section. Fred Kleist directed the event, and all the players were from Washington. USCF crosstable link; Seattle Saturday Quads (Mar 17); The Green Coquille All Ages Chess Tournament (Mar 17) in Coquille, OR; Portland Spring Open (Mar 17-18) - Good turnout at the Portland Chess Club for their Spring Open, 20 players in the Open Section and 27 in the Reserve. There were 39 players total in the 2011 event. As usual when he plays, Nick Raptis of Portland won the Open Section and this time with a perfect 5-0 score, the same as his win in 2010 of this event. Clemen Deng of Portland scored 4.5-.5 to top the Reserve Section. Gregori Alpernas of Lake Oswego handled the task of tournament director. USCF crosstable link; Seattle Chess Club Novice (Mar 18); Tacoma-Seattle Match (Mar 3 in Seattle) - Photos of the match by Roja Chalasani are available as a Picasa web album; Seattle CC Sunday Tornado (Mar 4); Portland Chess Shop Rapid Tournament (Mar 4) - New Grand Prix event!! Washington State Championship (concluded Feb 20) in Seattle, WA - the Washington State chess champion is Howard Chen, for the third consecutive year, with a 7 of 9 score - games are now available on the WA games page. Photo: Washington championship section group photo. Photo credit: Dan Mathews. More photos are available on the linked page. Oregon State Championship (concluded Feb 20) in Portland, OR - National Master Steve Breckenridge is the Oregon chess champion with 7.5 of 9 points (he tied with three others last year). Group photo available on the linked page. Idaho Closed Championship (concluded Feb 20) in Boise, ID - The Idaho chess co-champions are Blake Furlow and Larry Parsons! Photo: Some comical action at the Idaho championship: Tom Booth (Black) vs. Dan Looney (White), as Jim Stark (Black on next board) and Nathan Jiang (White on next board) watch. The organizers stepped in and made them use the proper equipment, which includes a chess board! Photo by Jeff Roland. Scholastics (February)! The top four finishers in the Washington State High School Chess Team Championships were Lakeside (22), Interlake (18.5), Newport (16.5) and Garfield (16.5) (Lakeside B). Randy Kaech reports (on Facebook). | Alexandra Botez, a 16 year old from Happy Valley, OR, did very well in the 3rd Jerry Hanken FIDE Open in Stillwater, OK (Feb 18-20). Her 6-2 score placed her 2nd to winner Eric Hansen's 8-0 score. USCF Crosstable link. | Congratulations to Kyle Haining for winning the 2012 WA Junior Open (scheduled for the MLK Monday holiday (Jan 16) and rescheduled for Saturday, February 4 due to weather conditions)! ; He tied for 1st with 4/4 along with Toshihiro Nagase and Ankush Puri. For his victory, Kyle is seeded into the 2013 WA Junior Closed and the 2013 Premier. The playoff games were played at the following time control: white starts with 10 minutes (no delay), black starts with 8 minutes and receives draw odds. By virtue of having superior tiebreaks, Toshihiro was awarded a bye and got to face the winner of Kyle and Ankush. Kyle picked white from a random draw and won on time against Ankush. Kyle and Toshihiro then played for the championship. Toshihiro selected black from a random draw. Kyle was too tough with the white pieces and forced resignation on move 38 threatening mate in one. | See photos from The Bellingham Herald of the 15th International Chess Jam, held by Northwest Washington Scholastic Chess on Feb. 4, 2012 in Ferndale, WA. | Maria N., a fourth-grader from Moses Lake, WA, won the Waypoint Foundation 2012 Chess Tournament, outlasting a field of 92 students grades K through 12 throughout the Columbia Basin. She took home a cash prize of $500! February! 20th Dave Collyer Memorial (Feb 25-26) in Spokane, WA - Players from WA, MT, OR, ID, CA totaling 64 (up a few from 2011 event but about the same as 2009 and 2010 events) took part in the 20th Annual David Collyer Memorial. Taking the top prize was IM John Donaldson of Berkeley, CA with a perfect 5-0 score. Same pairing in the 5th round this year as last which ended in a draw and tie for first with Paul Bartron of Tacoma, WA. This time John won the 5th round game and the $200 Stephen Christopher Memorial Perfect Score prize. James Stripes of Spokane placed 2nd with 4.5-.5. Check on Facebook for his comments on the event. Tournament director duties were handled by Kevin Korsmo of Spokane. USCF crosstable link. Photo: Donaldson giving the traditional Friday evening simultaneous exhibition before the Collyer main event (photo by James Stripes); Seattle Saturday Quads (Feb 25); Portland G/60 (Feb 25) - There was a tie for 1st place - Nick Raptis of Portland and Becca Lampman of Vancouver, WA won their first three games and then drew in round 4. 22 players took part under the direction of Neil Dale of Portland. USCF Crosstable link; Tacoma CC Mini Swiss (Feb 4); Seattle CC Sunday Tornado (Feb 5). Scholastics (January)! Michael Omori of Seattle, a junior at Lakeside High School, won the 2012 Washington High School Individual with 4.5-.5. The event was held Jan. 27-28 at Ferndale High School in NW Washington. He was the highest rated player in the tournament which was held in three sections and had 69 players. He can represent Washington State at the Annual Denker tournament to be held during the 2012 U.S. Open in Vancouver, WA. Crosstables link. | Chess for Success regional tournament (Jan 28) - see story in the West Linn Tidings about the Athey Creek Middle School’s Chess Mate Club. | Igor Ummel of Arlington scored 4-1 to top the 2012 Washington Junior Closed. The event was held Jan. 6-8, 2012. David Hendricks handled the TD task. Igor was the top rated player to enter the 6-player round robin event. January! Seattle CC Saturday Quads (Jan 28); Portland CC G/60 (Jan 28) - FIDE Master and USCF Life Master Nick Raptis of Portland continued his winning ways in the Portland CC G/60 events. In this event, he was the top-rated player and scored 4-0. Neil Dale of Portland was the tournament director. 20 players took part. USCF Crosstable link; B.C. Active Championship (Jan 28-29), Vancouver, BC; Seattle Chess Club Novice (Jan 21); Tacoma Open (Jan 21); Corvallis MLK G/45 Chess Tournament (Jan 16) in Corvallis, OR - The Oregon Scholastic Chess Federation sponsored a 45-player, 3-section event called the 2012 Corvallis MLK. Dan Dalthorp was the chief tournament director. NM Nick Raptis of Portland, OR won the Power Section with 4.5-.5. He was nicked for a draw by NM Corey Russell of Medford, OR. Henry Lancaster scored 4-0 to top the Mighty RDA Section. John Ornes Orn won the 3rd Section with 3.5-.5. USCF crosstable link; The 3rd Annual Golden State Open top section included 3 NWC players. Howard Chen of Monroe WA, Luke Harmon-Vellotti of Idaho, and Viktors Pupols of Kingston WA. They all scored 4-3 and Pupols won $84.50. He beat Luke, giving another one of his many lessons to young players. The tournament was held in Concord, CA (Jan 13-16). Crosstable: http://www.goldenstateopen.net/; Seattle City Championship (Jan 13-15) - This annual event was held at the Seattle CC under the direction of Fred Kleist of Seattle. In the 9-player Open section, Chouchanik Airapetian of Edmonds, WA scored a perfect 5-0. The Reserve Section had 24 players and a tie for first place at 4-1 between Masayuki Nagese of Redmond, WA and Dietmar Schimmel of Kirkland, WA; Gresham Open (Jan 7-8) in Gresham, OR - Nick Raptis won this annual event with 4.5-.5 score. The event had 47 players, versus 58 in 2011. Neil Dale handled the TD task. USCF crosstable link; Seattle CC Sunday Tornado (Jan 8) - There was a three-way tie for 1st, at 3-1, in the 15-player January Tornado. Kyle Haining, Peter J. O'Gorman and Masayuki Nagase all had that score. None of them lost a game but did give up draws or 1/2 point byes. Fred Kleist was the TD and played also. USCF crosstable link.